Ciara Torres-Spelliscy is a professor, teaching courses in Election Law, Corporate Governance, Business Entities, and Constitutional Law. Prior to joining Stetson's faculty, Professor Torres-Spelliscy was counsel in the Democracy Program of the Brennan Center for Justice at NYU School of Law where she provided guidance on the issues of money in politics and the judiciary to state and federal lawmakers. She was an associate at Arnold & Porter LLP and a staffer for Senator Richard Durbin. Professor Torres-Spelliscy has testified before Congress, and state and local legislative bodies as an expert on campaign finance reform. She has also helped draft legislation and Supreme Court briefs. She is the editor of the 2010 edition of the Brennan Center's campaign finance treatise, "Writing Reform: A Guide to Drafting State and Local Campaign Finance Laws." She researches and speaks publicly on campaign finance law as well as judicial selection. She has spoken at symposia at 36 universities around the nation, including Harvard and Stanford. She presented at the 2013, the 2015, the 2018, and the 2019 Annual Conventions of the Association of American Law Schools (AALS) and at the 2014 and the 2018 Annual Convention of the American Constitution Society (ACS), and the 2011, the 2014, and the 2016 Annual Conventions of the Council on Governmental Ethics Laws (COGEL). In 2016 she spoke at the Federal Election Commission (FEC) at a forum on dark money and foreign money in U.S. elections. In 2018, she spoke at the International Society of Public Law's ICON-S conference in Hong Kong. She is the author of the book Corporate Citizen? An Argument for the Separation of Corporation and State (Carolina Academic Press, 2016), and the book Political Brands (Edward Elgar Publishing, 2019). As well as publishing in law reviews, such as the NYU Law Review Online, the University of Pennsylvania Law Review Online, Harvard Journal of Law & Public Policy, the Duke Journal of Constitutional Law & Public Policy, and the Montana Law Review, Professor Torres-Spelliscy has been published in the New York Times, New York Law Journal, Slate, L.A. Times, U.S. News and World Report, Boston Review, Roll Call, Business Week, Forbes, The Atlantic, USA Today, Business Ethics Magazine, San Francisco Chronicle, The Hill, Huffington Post, The Root.com, Judicature, The Nation, Salon.com, Tampa Bay Times, The Progressive, CNN.com, Medium, Shondaland, and the ABA Judges Journal. She has also been quoted by the media in The Wall Street Journal, The Economist, The New York Times, Time, Bloomberg, Mother Jones, Newsweek on Air, SCOTUS Blog, Politico, Slate, The National Journal, USA Today, L.A. Times, Boston Globe, NBC.com, Vox, VICE, Five Thirty Eight, WMNF, Sirius Radio, National Public Radio, Fox, Voice America, CSPAN, DNA TV, and NY1. 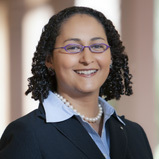 In 2014, Stetson University College of Law awarded Professor Torres-Spelliscy the Dickerson-Brown award for Excellence in Faculty Scholarship. In 2013, Professor Torres-Spelliscy was named as a member of the Lawyers of Color's "50 Under 50" list of minority law professors making an impact in legal education. In 2012, Professor Torres-Spelliscy was named as a Top Wonk by the website TopWonks.org. She was awarded tenure in 2016. In 2017, she was elected to be Chair of the AALS Section on Election Law for a term that started in 2018. Professor Torres-Spelliscy is a Brennan Center Fellow, a member of the Scholars Strategy Network, a member of the Board of Directors of the Mertz Gilmore Foundation, a former member of the Board of Directors of the National Institute on Money in State Politics, which was awarded the 2015 MacArthur Award for Creative and Effective Institutions.